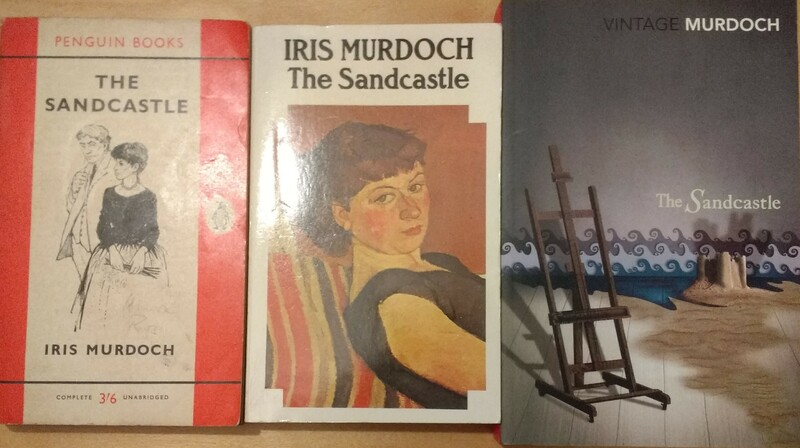 We’re on to Book Three in the Great Iris Murdoch Readalong and it’s time for “The Sandcastle”. I had these three copies to begin with and added a lovely hardback to the collection, but if you have yet a different cover, I’d love to see it. Tweet them to me, pop them on Facebook for my attention or use the email address you can find on my Contact Form. Again I’ve found a real change in my attitudes to the characters in these ones – although it turns out my earlier reviews are less than deep and instructive, and even my notes in my old Yahoo Group from my last readalong are not that helpful! Lucky I can remember how I’ve felt about all of the novels over the years! On this multiple re-read, I felt like this was more like a traditional novel than the first two, with a traditional setting, although schools and other institutions have come up. But I have changed my opinions on many of the characters. I had a weird change in my reading preferences when I got married (long-term readers of this blog will have heard this before). Even though I’d been with my husband for years (over a decade) before we got married, even though we have never had this issue in our relationship, suddenly, upon having that ring on my finger, I was unable to bear to read about marriages being threatened by affairs. I did manage to cope with this theme in this book (we’ve been married almost 4 years now so the upset of reading of such things has worn off a bit! ), however it seemed clearer to me this time how much the book is a portrait of the tiny relationship shifts, power battles and feelings that any long marriage or relationship is made up of: consider this, once Nan feels she has to confront Bill, “In ordinary life all her talk with Bill was planed down into simple familiar regularly recurring units. Any conversation which she might have with him was of so familiar a type that they might have talked it in their sleep” (p. 199). Murdoch skewers Nan and Bill’s marriage, highlighting every tiny fault line. I’d actually forgotten how much of Nan’s point of view we got, and how much of her vulnerability, and I found myself much more on her side this time. Rain I recall originally finding very cool and attractive. I’d forgotten how defenceless she does seem at times, and how insecure. I do wonder how people will read her and Mor’s relationship through the lens of current discussions of abuses of power etc – if you have read this book more than once, did you find your attitude changing with the times? I could see how people’s could, without necessarily seeing Mor as predatory – they seem to encounter and fall for each other – or use each other – equally, to me. Mor is pretty pathetic, though, now, to me: !he talked and talked … He was able to explain how and why it was that he no longer loved his wife” (p. 207). The good old themes are here – weird siblings and our first magic, maybe? Dogs, of course, with the lost / ghost Liffey, and we can note that Rain is shorn of her plaits between a painting at the exhibition and now. The sea comes in, and that powerful image of magic and the sea down in Dorset. Men with large heads and old men, and of course art. The theme of chasing a woman through the night came up again with Mor and Rain’s rose-picking exploits near the start of the novel. We have detailed descriptions of complicated arrangements, whether that’s the access to the school grounds, Felicity’s spell or the climb and rescue near the end (reminiscent of “The Nice and the Good, maybe?). I thought Bledyard had more sermons and speeches than he ended up having, which is interesting. And I ended up much fonder of him this time. It’s funny, again, of course, from Mor leaving his bicycle “in a place where bicycles were forbidden ever to be” (p. 154), Everard becoming more chubby and conciliatory as Demoyte becomes grimmer and more sarcastic (p. 169), or Felicity being very good at interpreting Tarot cards to her wishes. I’m not sure there’s an enchanter here, unless it’s Rain or even her father. But surely, and I don’t recall thinking this before, Revvy Evvy is actually a Murdochian saint. He’s benign and always in a muddle – a classic thing that reminded me of Tallis in “A Fairly Honourable Defeat”. He’s described as “so gentle and unselfish” but Mor can “hardly summon up any affection at all for poor Evvy” (shades of Tallis, again). He doesn’t care for matters of precedence and gets everyone in a muddle even when moving from room to room at the banquet. Is he thus a saint? Notions of good and freedom do come up, with Mor struggling to define freedom, not wanting it to be the absence of external restraint but more self-discipline to dominate our selfish desires, settling for it meaning absence of tyranny, trying to make it all political. When Bledyard talks about freedom, however, he says “Real freedom is an absence of concern about yourself” (p. 217). Is he being the saint here, or is he merely describing sainthood? He certainly stands in judgement and tries to interfere with matters, as does Demoyte, and unlike Everard. But he does “[accept] the storms that so often broke over him without surprise but also without interest” (p. 252) during his lectures. I feel like this book gets a little forgotten in the oeuvre, but it’s a complex and minute study, the first of Murdoch’s novels to be very tied to one place, with only a few forays out, maybe. I very much enjoyed my re-read. Interesting that you found your attitude to characters changed. Re-reading always brings something new. I’m afraid I’ve forgotten most of the plot of this one, but all those complex relationships in Murdoch novels are fascinating in themselves. It’s always so fascinating to re-read over the decades, isn’t it. I’m not surprised you’ve forgotten some of these as it was a while ago and one after the other coming new to them! Skimming this as I’m hoping to read it. I have managed the first chapter and like Mor a lot and don’t like his wife…. Aha – wonder if you will change your mind … Hope you continue to enjoy it! This is the one Iris Murdoch book I own – the Man of the House brought home a charity shop copy thinking it might be me kind of book – and I really will read it one day. Oh fabulous. It is a good one and not outside your comfort zone at all, I’m sure. Hope you get to give it a whirl! I have just finished re-reading The Sandcastle – like Liz and Heavenali, I do find it interesting that one’s response changes so much over the years and in light of everything one experiences and reads. In this last reading I was struck by just how interesting a character Nan is. She is portrayed as the joyless middle-aged wife in contrast to the sensitive beautiful and interesting artist Rain. The reader may think they are reading a domestic realistic story of middle class adultery, Murdoch gives much more and takes us into other places within this structure, using magic realism, art and tremendous comedy which verges on the slapstick for example when the car going into the river and the beautiful observation of the hierarchy and the social structure of the school. There are some wonderful scenes – even having read it before I could not bear the very graphic description of Mor watching Carde and Donald on the tower about to fall and the attempts to save them. I found Nan magnificent. But Nan is strong and still and clever. In the scene of the and the image of her at the presentation we see Nan as a sexually attractive woman. Although she is nervous as having to respond to the toast, she avenges her husband’s actions by pledging her loyalty to him in a proposal to stand as Labour Member of Parliament. Murdoch describes the turmoil of emotions and disruption around her as she continues now ‘speaking slowly and precisely’ and ‘everyone knew something odd was happening’. I am not sure also about the title – is Mor’s castle made of sand? Love Jonny and Maria’s insights although I identify with Mor too much to appreciate Nan, sorry! I enjoyed everything this time – plot, themes, characters and setting – wonderful. dithering emotional reversals, guilt and influence of non-conformist background. I actually see Bledyard as more of the saint as Evvy seems a little less rounded as a character. The theme – I agree about the building of castles/houses/dreams on sand (like the Gospel parable) – seems to prefigure the huge cultural swing towards self-fulfilment and free expression in the decades ahead and to assert that that way is not the ‘good’ way. That consideration of social responsibilities and the wider repercussions of our choices, must be prioritised over personal desire……Repression over Eros. And yet ……… we know that is an unsatisfying answer ………….. Thank you for your insights. I can see where you’re coming from identifying Mor with IM, although I wonder if Rain is also an idealised self-portrait. It’s so interesting reading the comments and reviews from everyone, especially those who are rereading it. My review is linked here and I was wondering if anyone had any ideas about the gypsy who made fleeting appearances? I felt like he was significant in some way but couldn’t figure it out. Have just got The Bell from the library so will be starting that soon! What a wonderful review, thank you. I have added a link in the round-up post. I think the figure of the gypsy is one of Murdoch’s weird, tangential but somehow linking people that hover around the edges of her novels, and also serves to be whoever the characters want him to be, illuminating them in the process. Thanks Liz, I really like that idea of the gypsy as a reflection of the characters themselves. I just thought of that when you asked; there’s always something more in IM even after all these goes. Liz, I have finished The Sandcastle, and plan to post about it this month (I’m behind). Thank you for organizing the readalong! I loved the book–and your review raises so many issues. You know her work so well, and though I have read several of her novels, not in years! This book is new to me. The moral philosophy issues are here, though less complex than I remember in her later books, and I like the way she presents both Mor and Nan as imperfect. I find Nan more sympathetic, being a wife, and like you having issues with adultery and so on (as a result of being a LONGTIME wife! ), even though Nan is unlikable. Mor is selfish: I don’t think he’s predatory; men do always fall for younger women. I was surprised Rain reciprocated. She did seem several cuts above him. And then the issues of the children, which Mor ignores. I was horrified by the climb up the tower, really afraid something would happen to the boys. All the characters are interesting, and that should have been a wake-up call for Mor. Of course I’m not at all sure Nan should have spoken up at the banquet, but Mor was sneaking around so I kind of think she was right! I agree about the slightly lower complexity and in some ways this feels like her most traditional novel. I’m glad you don’t find Mor predatory: I was worried that people would feel that after seeing it through the lens of current events, as my reading groups did with The Bell. I love the ending too. This was my second time reading The Sandcastle and it was a pleasant surprise, as the first time (decades ago), I had more or less dismissed it. I had come to it after reading most of her other work, and in comparison I found it rather conventional. I had difficulty placing it in her work. Now I feel I must have originally read it in a fog because there is so much to enjoy and appreciate, and it is clear, as you have pointed out, that the Murdochian themes, characters and set pieces are there. Like others, I found myself gripped by the tower scene and possibly even more this time round by the scene of the car sliding down the bank. She handles the scene wonderfully, putting the reader on edge, setting up a contrast between Mor’s unease after his lying phone call to Nan, and Rain’s unselfconscious delight in the river.I kept saying No, No, in my mind, hoping the characters would turn back, even though I knew what was going to happen. I liked the comment that there is a bit of slapstick here; for me there was also an element of nightmare. I think it is that combination of nightmarish situations with an element of the absurd that we see heightened to an almost hallucinatory effect in some of the set pieces in her later works. I like the idea that the gypsy is what people make of him. I find it interesting that the gypsy appears only after Mor takes the wheel of the car, though I’m not sure of the significance. Certainly in the context it seems like an omen for Mor (and also for Rain, who is even made uneasy by this encounter). It also feels to me as if Murdoch is playing with conventions (or maybe I’ve just read too many novels with dark gypsies and Tarot decks foretelling disaster). Because of the convention, it’s easy for the reader at this point in the novel to read into him some kind of omen as if their fates are sealed. But Mor is responsible for his own fate, he is literally in the driver’s seat. Later I think, at least for me, the gypsy goes beyond being just a sort of symbol and we see him drenched and possibly afraid, possibly deaf. There’s more there but we will never know what it is. Reading this novel in order, it struck me how it is really the first time Murdoch dealt with a relatively enclosed community outside the city. With that focus and the greater emphasis on religious discussions, I can better see how this would be a bridge to The Bell, another book I’ve only read once and which I look forward to rereading. Thank you for your comments: I think this is perhaps the most conventional of her novels, but yes, indeed, she takes an enclosed set of people and she does have all her themes in there. I like your point that it’s a bridge to The Bell with the almost-sermons and isolation of the community. Sometimes I feel her early novels get a little overlooked but that’s why I love reading the books in order. I hope you enjoy The Bell, too, and I’m glad this has been a revelatory read for you. A great review, thank you, and an interesting point! I’ve added a link to your review to the round-up post. Hope you enjoy The Bell! Hi Liz, I hope I’m putting this in the right place! I’ve just got A Severed Head from the library and can’t wait to start! I suppose it would really belong on my (late) review of “The Bell” here https://librofulltime.wordpress.com/2018/02/23/book-review-iris-murdoch-the-bell/ but it’s fine, I’ve added your link to the round-up post here https://librofulltime.wordpress.com/2018/02/28/the-bell-round-up-and-a-severed-head-preview-imreadalong-irismurdoch/ so people can find it. I loved your contrast of Toby and Dora, very perceptive. I will admit to you here that some people do skip the sermons; there are chunks of philosophy in other books but Severed Head zips along without too much of that sort of thing! Oh, and thank you for reading and reviewing “Iris Murdoch and the Common Reader”! I am catching up on the #IMReadAlong challenge and, wow, what a perfect book for such a situation. The Sandcastle grabbed me from the first page, didn’t let me go and kept me guessing right until the final page about how things would end. I was once again struck by how efficiently Murdoch can give you the a sense of an entire personality with just a couple of insights. I very quickly had a feeling for Mor and Nan. Even, perhaps, from their names. Mor is dissatisfied and wants more from life, although he is initially too timid to take action. Nan is almost a non-entity – happy that she is “successfully married”, with no reference to feeling happiness or satisfied. She is openly critical or her own children and feels nausea at the sight of a rainbow. Despite feeling almost contempt for both of these characters I was gripped by the narrative. Despite the small word we inhabit in this book, the pace of adventure seemed much faster than Net or Enchanter. There was almost no slack in the narrative and, with a few brief exceptions as articulated by Bledyard, little in the way of explicit philosophising. The tension was at its greatest with the tower-climbing passage. The rule of Chekhov’s gun had been invoked earlier in the novel when Felicity found the boys’ secret plans. Yet I had no idea whether the one or both of the boys would be saved or plummet to oblivion. The tension of the plot was punctuated, yet again, by moments of ripe humour. There were several giggle-inducing moments, particularly the description toward the end of how the characters kept themselves occupied during an interminable after-dinner speech. It wasn’t just the tautness of the plot, however, that kept me engaged throughout. What Murdoch conveys in this book, which I hadn’t noticed quite so much in the previous entries, is the sense of atmosphere. And a particularly English sense of atmosphere. From the smell during the heatwave of “warm grass and canvas” under a canopy on the cricket green, where cucumber sandwiches are served. To the hallucinatory Midsummer Night’s Dream-world of the forest. A place where strange things happen, where people disappear, where you smell the loamy scent of the earth. I wondered if Jez Butterworth had read these passages before writing Jerusalem and setting all the action in a clearing deep in a southern English wood. I had a few very small complaints. Maybe because Murdoch was limbering up to explain the dynamics of the tower, ledge and ladder at the end, there were several sequences when she was describing the mechanics between different objects. Specifically, the car on the riverbank and the a much shorter description of Donald and Carde is some form ankle-touching embrace in the former’s room. I lost total absorption because I couldn’t construct mentally the basic physics of the scene. But there are small things. The Sandcastle was a treat from beginning to end. A fabulous review, thank you for submitting it. And I’m glad people are keeping going and adding reviews to the books; this is what I intended to happen. I can work out the car OK but those knees and ankles, yes, indeed. You’re right about the sense of atmosphere: it is a very English book (if you haven’t yet read A Word Child, you’re in for a treat when you get to that one!). She’s observing it so curiously that she really gets all the detail in. I can’t recall a a more brutally precise description of heartbreak or grief than this. It’s amazing and brutal, isn’t it.